Channels each with 3 Modes controlled by a simple mini-toggle MODE switch found in the upper left corner of each Channel. 45, or 10 Watts of MULTI-WATT™ power at your command for each channel, just select the power you need. 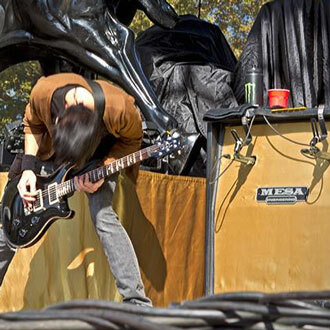 Pete Loeffler of Chevelle running Mark IVs, Mark Vs and Rectifier Standard Straight 4x12 Cabs. 9 Amplifiers in 1: A lifetime investment. No less than 9 patents stand guard over your Tone... ensuring your investment will be protected and your amp will hold its value. (MARK IIC's and MARK IV's still sell for more than their original purchase price). Beware of imitators! Fine musical instruments never go out of style and the Mark V is no exception. Like its predecessor the MARK IV - in steady production for over 19 years - the MARK V is an investment in your musical future. The 9 preamps and 3 power amps it contains trace their roots back to the beginnings of amplified guitar. Yet while their lineage is time tested, the performance they unleash is brand new and cutting edge. This collection of amps will propel you through any musical style and project, and band any era of your development with confidence and command. 3 distinct Channels present the 3 footswitchable sounds in a simple to dial platform, but don't let that fool you… beneath each set of controls lies another layer of performance. Each preamp Channel contains 3 distinct Modes that are controlled by a simple mini-toggle MODE switch found in the upper left corner of each Channel, which is responsible for the voicing of each Channel. 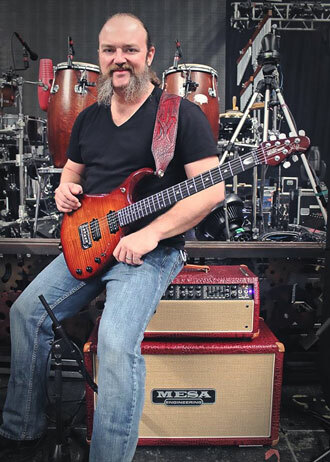 John Driskell Hopkins of Zac Brown Band with his custom Red Crocodile embossed leather/Tan Grille Mark V head and matching 2x12 Rectifier Horizontal cabinet. The Mark V features our popular channel assignable Multi-Watt™ Power that determines the amount (wattage) and type (configuration) of power each preamp channel will be coupled with to create a classic sound via independent channel switches. Any amplifier's sound is 50% preamp and 50% power, so these switches are responsible for a large part of a given Channel's personality and feel. The choices repeat for all 3 Channels and they are 90W, 45W and 10 W. Using the switch is simple… just select the power/feel you want for each Channel, keeping in mind that the greatest headroom, focus and authority will always be found in the 90 watt position. Each Channel is fitted with a mini-toggle to select the 5 Band Graphic EQ, but the fun doesn't stop there. The MARK V gives you the choice of two ways to utilize the power of the Graphic EQ for each Channel! The mini-toggle within each Channel (center mini-toggle) allows you to decide whether you want the EQ on all the time in that Channel, off all the time or activated by the EQ button on the Footswitch. A separate set of mini-toggles to select SLIDERS or PRESET for each Channel (located in the left side of the Graphic EQ section) allows you to select whether you will use the actual SLIDERS to shape your individual EQ curve or, a PRESET contour based on the ever- popular "V" curve. The ability to choose between these two options when assigning the Graphic EQ to your sounds gives you ultimate flexibility when dedicating the Channels. By combining subtle blends of the Tone controls with the EQ options, virtually any sound you can imagine is at your fingertips. Since 1981 Simul-Class™ Power has been the heart and soul of the MARK Series amplifiers, imparting its sweet, musical character onto any sound in the vast library of the now classic MARK legacy. The Mark V proudly carries that legacy forward with Cleans that shimmer with transparent layers of sweet delicate highs, while the bottom end breathes a warm fundamental under a bed of rich low mid ambience. Never harsh, always fat, the Simul-Class lead tone is the quintessential single-note solo sound that is best described with a human trait…VOCAL. 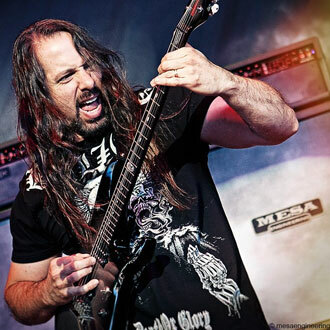 The MARK V provides access an unprecedented number of tone shaping features. At first glance it might seem a little intimidating but with a second look you’ll discover that it’s very intuitive, as each channel has the same basic features repeated - Once you know one, you basically know them all. Better yet, we designed the Mark V to deliver exceptional, fast and easy “plug and play” convenience. You’ll be amazed by the instant tonal gratification from each channel, as well as its ease of tonal “dial-ability” to find YOUR signature sound. With so many innovative features, the Mark V may well just be our most versatile amplifier. Visit a dealer today and hear the magic of the MARK V, as there is truly no other like it.